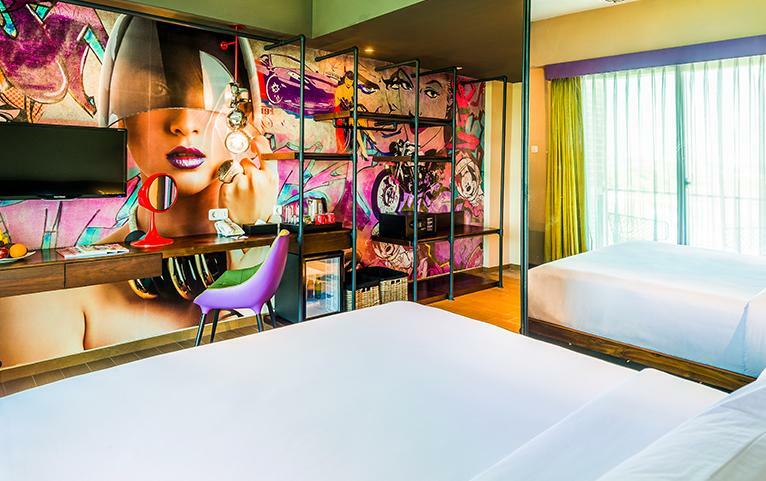 Treat yourself with 3/5 nights of blissful hospitality at Dash Hotel, Seminyak, Bali. Located at one of the most stylish and posh areas in Seminyak, Bali, the hotel offers world-class luxury so that you can have the best getaway of your life. 3 Nights Dash Studio – 32 sq.m. 3 Nights Dash Deluxe – 46 sq.m. 5 Nights Dash Studio – 32 sq.m. 5 Nights Dash Deluxe – 46 sq.m. Bid adieu to the everyday chaos as you indulge in a lavish and relaxing getaway at Seminyak, Bali. Dash Hotel at Seminyak Bali offers a great start to your day with complimentary a la carte breakfast, one time set mini bar, free entry to the nightclub, discounts on food and laundry services and relaxing massages for two. Dash Hotel is located in Seminyak and is around a 30 minutes’ drive away from Ngurah Rai International Airport (Denpasar). Just a short stroll away from the hotel, you can have access to the internationally recognised shopping centres, restaurants, bars and clubs. For the golf enthusiasts, Nirwana Bali Golf Course, a Greg Norman design course that’s voted number one in Asia, is just a short drive away, near the revered Hindu Temple of Tanah Lot. For horse ride enthusiasts, the Umalas Equestrian Center is nearby, and for the beach lovers, Petitenget Beach with sweeping views and the beautiful wide sandy beach is within walking distance. Dash Hotel features an urban industrial style that can be adapted to its environment and location. Combining a stylish yet distinct design and atmosphere, with the exquisite services, the hotel makes an ideal choice for a luxurious stay. The hotel features around 136 luxury rooms, a fitness centre, spa centre and a shopping house. With a well-appointed meeting room, a rooftop bar & restaurant, Dash Hotel is well-addressed to welcome guests seeking luxury and bliss during their vacation. Dash Studio - 32 sq.m. 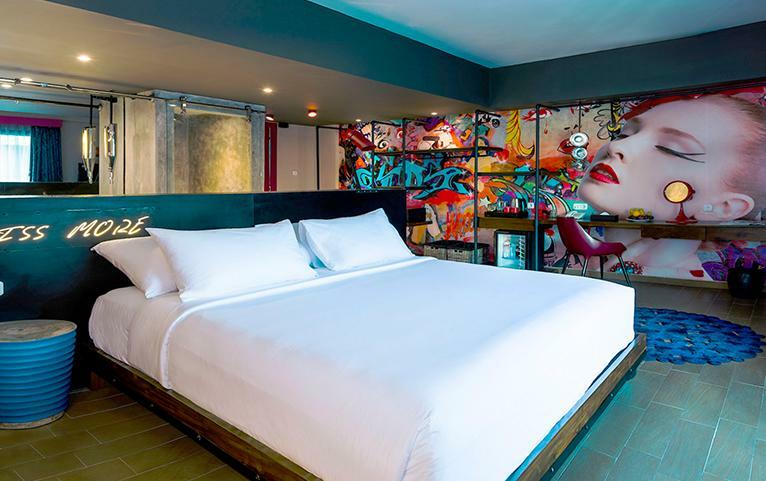 These rooms are uber stylish and comfortable, with custom iron furnishings, graffiti artwork and retro industrial, chic light fixtures. The Dash Studio is 32 sq. Metres large and comes a with balcony, luxury king & twin beds with cotton linens. The rooms are equipped with free Wi-Fi, a 32-inch flat screen TV with 75 satellite channels. You will find the refreshment centre with minibar, tea & coffee making facilities, climate control and room safe for your laptops. The bathroom features a rain shower, towels, toiletries kimono and slippers. Dash Deluxe - 46 sq.m. These rooms are a combination of glitz and glam. The iron headboards reinforce the industrial ambience, with solid wood beds constructed from a Javanese Joglo. The Dash Deluxe is 46 sq. Metres large and comes with a balcony, luxury super king beds and cotton linens. The rooms are equipped with free Wi-Fi, 40-inch flat screen TV with 75 satellite channels. You will find the refreshment centre with minibar, tea & coffee making facilities, climate control and room safe for your laptops. The bathroom features a rain shower, towels, toiletries kimono and slippers. Maximum Guest Capacity: The maximum room capacity for Dash Studio is two adults and the maximum guest capacity for Dash Deluxe is two adults and one child (aged below 12 years). See the ‘Extra Guest Policy’ and ‘Child Policy’ for more details. Child Policy: For Dash Deluxe room, one child (aged between 0-5 years) may stay free of charge. And child aged between 6-12, may stay for a surcharge of USD 10 per night (sharing bed with parent) and breakfast payable directly to the hotel. Extra Guest Policy: No extra guests are allowed to stay. Laundry Service and Dry Cleaning: Never let there be anything dirty when it comes to clothes. All your washing and dry cleaning will be taken care of during your vacation. The services would be chargeable but worth it. 24- Hour Room service: Experience the indulging at any hour of the day. Concierge and Travel Desk: To offer you a smooth and hassle-free stay and an exotic vacation, the travel concierge will be available at your service. Dining: Try your hands on the most drool-worthy cuisines and cocktails at The Shack- Rooftop Bar and Mya Kitchen and Cocktails. Do not miss out on availing amazing discounts provided. DASHOPPE: You get to experience fashionable shopping that’s just a few steps away from the comfort of your room. The Dashoppe features a collection of apparels, jewellery, body care and souvenirs. Rabbit Hole Spa: The Rabbit Hole Spa creates an extraordinary spa experience. This unique spa offers guests a range of treatments from head to toe with natural ingredients. Flex- the gym: The place where Fat is Burnt and Pride is Earned! That is what they call the gym at Dash Hotel, Seminyak. Do try out the gym and stay fit. The hotel is a 35-minutes drive away from Ngurah Rai International Airport. Bali is well connected from all the metro cities in India by air. You can easily avail cab services from the airport to the hotel.